Russian nesting doll (stacking doll) or Matryoshka doll is a set of dolls decreasing in sizes placed one inside another. The word mah-tr-o-sh-kah is related to the old Russian word mat , meaning mother. We present a limited edition of Russian Nesting Dolls. This precious collection was made in the city of Simbirsk, which has a famous and recognizable style. If you are familiar with this style you will appreciate these masterpieces. If you have never seen these Russian artist creations you will be amazed with their beautiful work, as you can see in these gorgeous pieces. This charming Mama Cat doll has. Lot of tiny details which are not visible on the pictures below. The doll is very bright and attractive. The set is hand crafted, hand painted and signed by the artist. Excellent condition from non-smoking home. This Cat doll is truly unique and will be the star of any serious collection. Base Diameter: 1.75 In. All time estimates are based upon orders placed within the continental United States. International orders will roughly be delievered within 6-24 days. E do not devalue items or mark them as gifts. And International Government Regulations prohibit this behavior. WILL BE PROVIDED ONCE AVAILABLE. Please feel free to ask any questions. 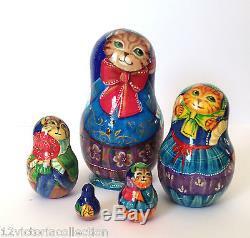 The item "CAT FAMALY Russian Hand Carved Hand Painted UNIQUE Nesting Doll Set" is in sale since Wednesday, October 16, 2013.